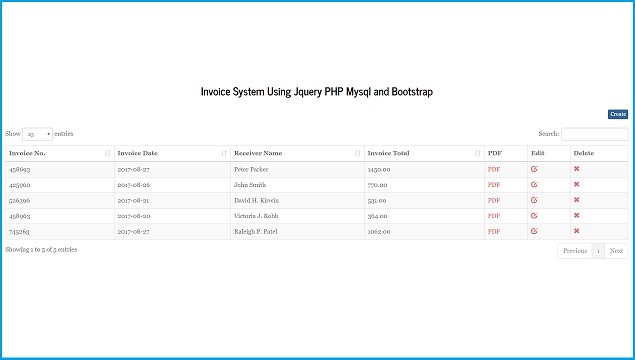 In this post we are going to discuss Invoice or Billing Management System by using PHP Script with Jquery. For make Simple Invoice we have use not only PHP JQuery but also we have use Bootstrap Framework and Mysql database also. In this system we will not create Invoice or Billing for one item but here we will make system that will create multiple dynamic item Invoice. This is simple script and this script any one can use for his project or learning purpose like how to developed Invoice System by using Open Source PHP and Jquery with Mysql and Bootstrap. From this post you can gain knowledge to make Simple Billing System in PHP. This is the time digitization, all type of transaction has been done online, so for here we have make online Invoice system using PHP. By using this script you can make invoice online. In this tutorial you add some other functionality like after making of invoice you can email this invoice to particular person also. In short you can generate digital invoice from this script. After making of invoice you can also convert that invoice into PDF format also. Here we have also discuss how to convert digital invoice into PDF format, so we can also get hard copy of Invoice also. By using this script you can generate invoice by filing simple form in which we have use JQuery for add multiple item. In this system We can generate new invoice, we can edit or update invoice details, we can delete or remove invoice and lastly we can also generate PDF file from that invoice also and after this we can get print from PDF file also. This way we can generate unlimited invoices from this system. In this system we can add multiple item in single invoice by using Jquery and this form we can also add tax details also and this all calculation has been done by using Jquery. Suppose you want to remove any product from invoice then you can also remove product from Invoice also. In this system all calculation has been done by using JQuery code, so by using this JQuery we can make dynamic product invoice form. And lastly in this system you can also get the details of previously generated invoice also. (charCode != 46 || $(element).val().indexOf('.') != -1) &&      // “.” CHECK DOT, AND ONLY ONE. Sorry to say but this does not work for me. Awesome, Very nice tutorial. It works fine for me. If this code not works for any body, He has/have to download and add the jquery,bootstrap and datatable libraries from internet. where to get that file? Need to work on it......with patience..
its not working for me...the datepicker, add button, total function and tax function still not working for me..can u help me by sending the code at my gmail? Sir can you please share the all libraries links used in this code. I downloaded some but that are not fully functional. You Should download Bootstrap manually and unzip the css and js folders in your folder with .php files. Refresh your browser and it works. how to create a button that prints all the invoices instead of clicking each of the pdf button ? and at last refresh your browser, tadaa it works. how to upload image with this crud? Thanks a lot.. it is working. not working upload to database,datepicker and add row. Any help please! Where are Bootstrap, Jquery, Js files and (dataTables, datepicker) files etc ? Hi i am still facing issue. Can you guide me. Hallo guys how can i validate if the invoice item already exist in database before inserting for loop with invoice items.